East Helena, MT (April 23, 2019) – The Montana Environmental Trust Group, LLC, as trustee of the Montana Environmental Custodial Trust, recently sold three parcels comprising almost 400 acres at its East Helena Superfund Site (the East Helena Site), generating nearly $3 million in sale proceeds to help pay for additional cleanup activities and paving the way for mixed-use and residential developments as well as a new public high school. In October 2018, the Montana Environmental Custodial Trust (the Custodial Trust) completed the sale of the 254-acre Lamping Field property to an affiliate of Butte, Montana-based Town Pump, Inc. (Town Pump) for a mixed-use development. The Custodial Trust also closed on the sale of two Dartman Field parcels—35 acres in November 2018 to the East Helena Public Schools (EHPS) for a new high school, and 100 acres in December 2018 to Billings, Montana-based Oakland Companies for a 319-unit, single-family residential development. The Custodial Trust’s land sales mark a turning point in the transformation of one of the country’s most complex hazardous waste sites, and the integration of community-supported reuses into remediation of former American Smelting and Refining Company (ASARCO) lands in East Helena. A century of lead smelting by ASARCO at the East Helena Site contaminated soils, sediments and groundwater. In December 2009, the Custodial Trust was established as part of the global settlement of the ASARCO bankruptcy. As part of the settlement, the Custodial Trust assumed responsibility for owning, administering, remediating and facilitating reuse of thousands of acres of contaminated land formerly owned by ASARCO in Montana, including the East Helena Site. The majority of corrective measures designed to address contamination from the former smelter have been implemented. The Custodial Trust has already documented reductions in groundwater contamination from the smelter. The Custodial Trust, in its ongoing partnership with its beneficiaries—the United States and the State of Montana—and the East Helena stakeholders, looks forward to implementing final cleanup measures and paving the way for redevelopment of the remaining ASARCO lands. The 2018 land sales have helped fulfill the Custodial Trust’s goal of returning former ASARCO lands to productive reuse in a manner that protects human health and the environment while benefiting the East Helena community. This map of the East Helena Superfund Site shows the Montana Environmental Custodial Trust’s land sales since 2012, including the sale in 2018 of three parcels totaling nearly 400 acres that generated $3 million for cleanup and paved the way for a new high school and mixed-use and housing projects. 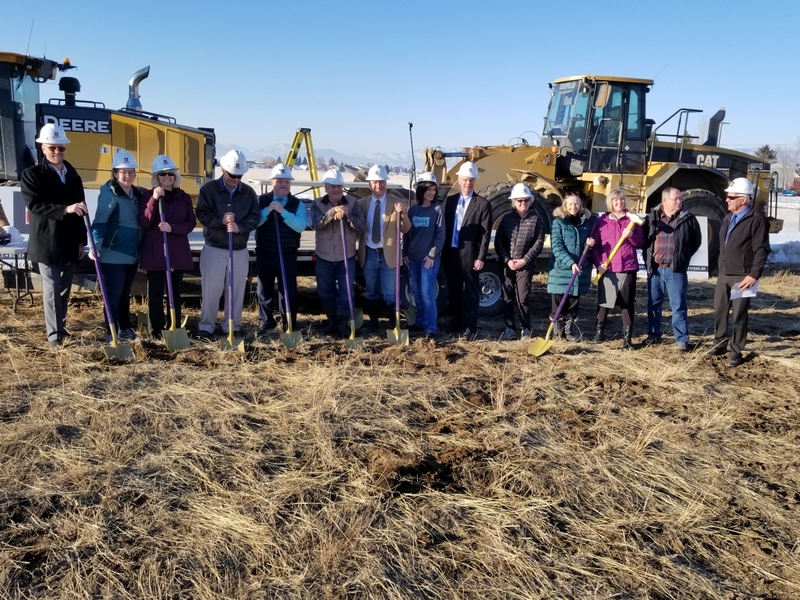 As part of its efforts to market and sell Lamping Field, the Custodial Trust partnered with the Montana Business Assistance Connection (MBAC), a non-profit economic development corporation. In 2017, MBAC received a grant from the Montana Department of Commerce’s Big Sky Economic Development Trust Fund to help position Lamping Field for sale—and the Custodial Trust matched the grant funds. In late 2018, the sale of 254 acres at Lamping Field to Town Pump put a pivotal parcel into the hands of an owner-operator of more than 200 businesses, including hotels, casinos and convenience stores, in Montana and Idaho. In East Helena, Town Pump operates two convenience stores, and the company’s purchase at Lamping Field comes as part of its aggressive acquisition and development strategy. The Town Pump land purchase has already had positive ripple effects. “The Town Pump transaction helped catalyze the subsequent land sales at nearby Dartman Field,” said Cindy Brooks, the Custodial Trust’s managing principal and the president of the Greenfield Environmental Trust Group, Inc., parent of the Montana Environmental Trust Group (METG), trustee of the Custodial Trust. Brooks said the Town Pump purchase will encourage future reuse of other tracts too. “There’s always synergy. It sounds corny, but if you build it, others will come,” Brooks said. Acquisition of 35 acres at Dartman Field has allowed the EHPS to proceed with construction of the first-ever East Helena High School. It will be built near the newly opened Prickly Pear Elementary School, which is located on a 50-acre Dartman Field parcel that the Custodial Trust donated to the EHPS in 2016. The high school was made possible by an act passed by the Montana legislature in 2017, followed by two ballot referenda approved by East Helena School District voters that, first, authorized issuance of a $29.5 million bond to build the high school, and second, approved acquisition of the Dartman Field parcel for the high school. Finally, in November 2018, the Dartman Field Minor Subdivision—East Helena’s first ever subdivision—created the EHPS parcel. Construction of the new high school began in March 2019. 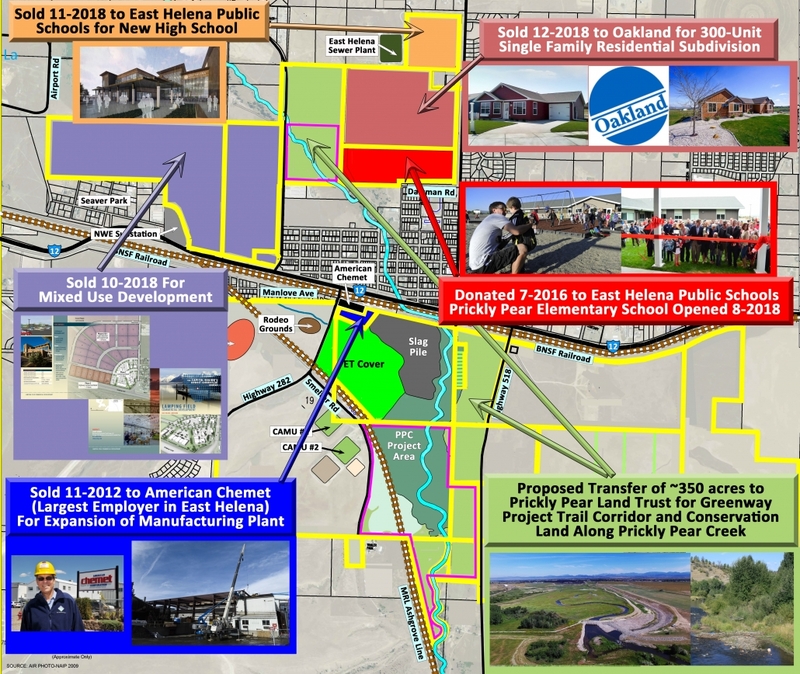 The immediate proximity of the planned East Helena High School and the new Prickly Pear Elementary School helped motivate Gary Oakland to buy 100 acres at Dartman Field for development of the 319-home, single-family Highland Meadows Subdivision. Oakland’s residential project is aligned with the reuse plan envisioned by the City of East Helena for this area, as reflected in the decisions by the City Planning Board, City Zoning Commission and City Council to rezone the property from an agricultural to a residential district in 2017. Oakland has been working with the City to secure approval of the Highland Meadows subdivision so that the company can break ground on the first phase of development in the summer of 2019. As part of the Custodial Trust’s remediation of the East Helena Site, more than a mile of Prickly Pear Creek was realigned to reduce groundwater contact with soil contaminants. The creek now flows through hundreds of acres of newly restored floodplain, habitat and conservation land. With the creek’s rehabilitation mostly complete, in collaboration with EPA and the State of Montana Natural Resource Damage Program, the Custodial Trust is actively exploring the potential transfer of 350 acres in the creek corridor to a long-term steward to ensure public recreational access to the waterway for generations to come. The nonprofit Prickly Pear Land Trust has expressed interest in acquiring acreage for inclusion in the proposed Prickly Pear Creek Greenway trail linking East Helena to communities nearby. East Helena stakeholders have also voiced support for creation of a recreational resource along the creek. “There’s currently no public access to Prickly Pear Creek or significant dedicated green space in the City of East Helena, which is one of the many reasons the Custodial Trust supports implementation of this beneficial public use,” Brooks said. Awards. 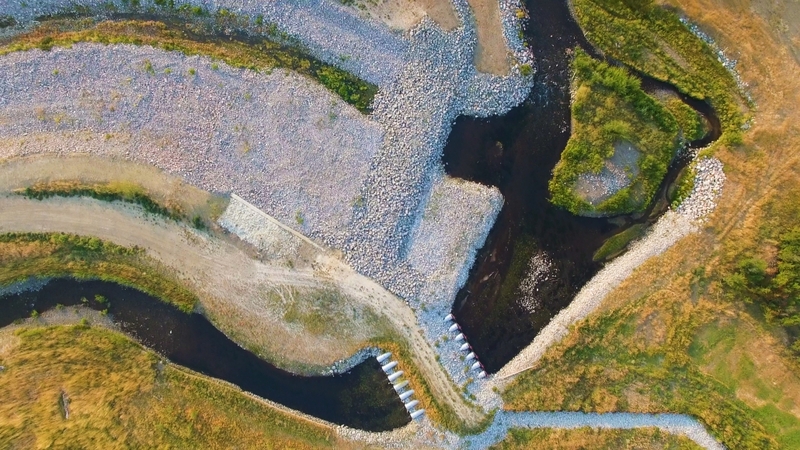 The Prickly Pear Creek project also is a finalist for the ACEC 2019 Grand Conceptor Award, which signifies the best overall engineering achievement in the country. New Owner: East Helena Opportunities LLC, affiliate of Town Pump, Inc. The Montana Environmental Trust Group (METG), as trustee of the Custodial Trust, was established in 2009 as part of the global settlement of the ASARCO bankruptcy. The Custodial Trust’s primary role is to protect human health and the environment in partnership with its beneficiaries—the United States, acting through the EPA, and the State of Montana, acting through the Montana Department of Environmental Quality —and with community stakeholders. The Custodial Trust’s responsibilities include owning, administering and remediating two federal and two state hazardous waste sites in Montana: the 2,000-acre East Helena Site as well as hundreds of mine-scarred acres at the Upper Blackfoot Mining Complex/Mike Horse Mine, the Black Pine Mine and the Iron Mountain/Flat Creek mining area. The Custodial Trust received $138 million to remediate and facilitate reuse of the four sites. The Custodial Trust has been managing remedial actions that have included construction of a sustainable cover system—the largest of its type in the country—and excavation of tons of contaminated material, as well as relocation of Prickly Pear Creek. METG is a subsidiary of Greenfield Environmental Trust Group, Inc.
DENVER — The U.S. Environmental Protection Agency (EPA) celebrated a milestone achievement with the East Helena Public Schools and other agencies and organizations at a ground-breaking ceremony at the future location of the East Helena High School at 2760 Valley Drive in East Helena, Montana yesterday. EPA, EHPS, the Montana Environmental Trust Group LLC (METG), and the State of Montana worked with community residents to identify ways to reuse property that is protective of public health and the environment.METG, as trustee of the Montana Environmental Custodial Trust, sold 35 acres at the East Helena Superfund site to EHPS for the new high school in November 2018. Read entire press release on the EPA website here. EAST HELENA, MONTANA— Residents and commuters driving on State Highway 12 or Smelter Road near the American Chemet facility should take one last look at the former Asarco Ore Storage and Handling Building (OSHB). That’s because the massive pre-cast concrete structure—bigger than a football field and more than six stories high—is coming down. “Barring weather delays, demolition of the OSHB is slated to begin on April 8th,” according to Cindy Brooks, head of the Montana Environmental Custodial Trust, the Trustee that assumed responsibility for cleanup of the Asarco 2009. Under oversight of the US Environmental Protection Agency (EPA), the Montana Trust is poised to begin construction of several measures designed to address groundwater and soil contamination resulting from a century of smelting operations. In the coming weeks, the Montana Trust also plans to remove other buildings near the OSHB, including the two green-and-yellow fabric structures—dubbed the “Barnham and Bailey” buildings because they resemble large circus tents. EPA and the Montana Trust are seeking to recycle and salvage as much material as possible from the planned demolition activities. According to Betsy Burns, EPA Cleanup Manager for East Helena, “It’s gratifying to see demolition move forward after several years of planning and studies. This work represents an important step in the clean up the former Asarco smelter.” EPA and the Montana Trust hope to remove the remaining on-site structures by the end of next year, leaving the 14-million ton slag pile as one of the last visible remnants of the Asarco smelter. Burns also advised that, “Folks may see construction on the western side of State Highway 518 just east of Prickly Pear Creek where power, telephone and water lines will be relocated to make way for construction of the temporary bypass channel for the section of the creek below smelter dam.” The Montana Trust has been working closely with the City of East Helena, NorthWestern Energy and Century Link on these utility projects. The OSHB is the largest and newest building on the smelter property. In its heyday, the Asarco smelter produced lead bullion from diverse concentrates and ores from mines and facilities all over the world. In 1988 alone, Asarco received more than 200,000 tons of such raw materials—delivered by rail or truck, offloaded, stored in piles and then blended and mixed with fluxes to render them suitable for smelting. Before the OSHB was constructed in 1990, these operations took place in the outdoor storage yard or in a small, unventilated building, which generated significant, uncontrolled dust. The OSHB was designed to enclose and ventilate these operations in order to control dust emissions. The useful life of this behemoth structure was cut short after little more than a decade, when the smelter was shutdown in 2001. The Montana Trust assumed ownership, management, cleanup and redevelopment responsibility for the ASARCO sites in Montana, including the former East Helena smelter, when the ASARCO bankruptcy was settled in December of 2009. The Montana Trust is cleaning up the East Helena site under the oversight of EPA as Lead Agency. Other Montana Trust sites include former ASARCO mines in Lincoln, Phillipsburg and Superior. The United States and the State of Montana are the beneficiaries of the Montana Trust. The Montana Environmental Trust Group (METG), Trustee to the Montana Environmental Custodial Trust, is accepting applications for both a water treatment plant operator and a mechanic near Lincoln, MT. Compensation is from $15 to $22 per hour depending upon experience.